Home / Fanboying! • Props and Costumes • Stars of the 1980's and 1990's / Oh Rocky! Meeting The Cast Of Rocky Horror Picture Show! Nell Campbell & Patricia Quinn! Autographs! Almost Famous Props! Keith Coogan! 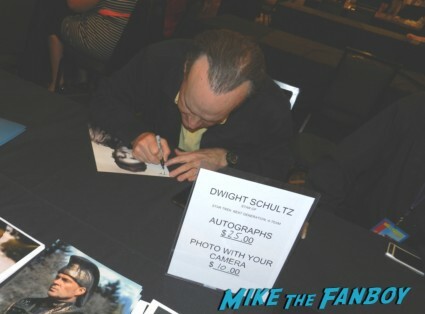 Dwight Schultz! And More! Oh Rocky! Meeting The Cast Of Rocky Horror Picture Show! Nell Campbell & Patricia Quinn! Autographs! Almost Famous Props! Keith Coogan! 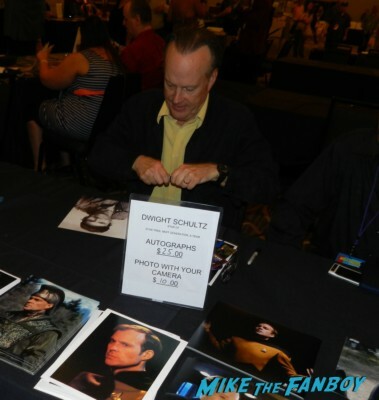 Dwight Schultz! And More! It’s amazing how time catches up with you! I didn’t even realize what was this weekend. Besides the Los Angeles Time Festival of Books it was also the Hollywood show. Now, there were a couple people I was interested in meeting and I got a text that Scotty was also planning on going so we decided to meet up and head over together. The Hollywood Show was staging a mini Rocky Horror Picture Show reunion and since it’s one of my favorite movies… I had to check it out. Patricia Quinn and Nell Campbell were here along with Barry Bostwick. 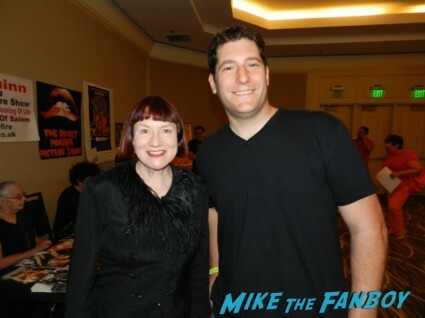 Now, I have met Barry and with prices being a little steep I thought I would stick with Nell Campbell and Patricia Quinn since they don’t make there way to the west coast all that often. It was time to meet the gals of Rocky Horror Picture Show! First up was Nell Campbell. For those of you who didn’t see the film Nell played Columbia and had the tap dancing scene during the Time Warp. Nell was very nice and we talked for a hot second about the film and I also got a photo as well. Then Patricia Quinn! Patricia played Magenta in the film and was super nice. She was simply adorable. I told her that she needed to come to the west coast more often. She laughed and said that everyone has been saying that. We also got a quick photo as well. Scotty and I did some magazine shopping and I of course found a few magazines that I thought were pretty cool. 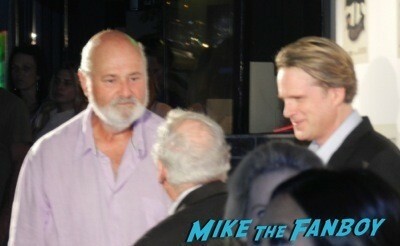 Pinky and Scotty were chatting for a while while I spoke with Greg. We headed over to see Dwight Schultz from The A-Team. He was very nice and Greg got a photo signed by him. I debated and debated about these Almost Famous props. 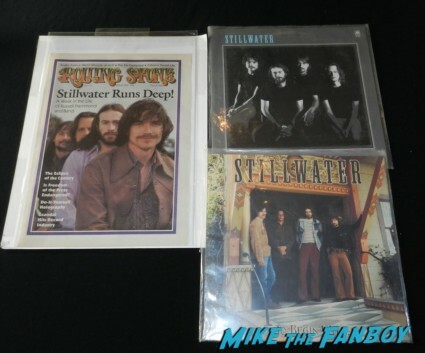 One vendor had the original Rolling Stone magazine cover featuring Stillwater and two LP’s as well…. and then I did it… I broke down and bought the Stillwater Rolling Stone and LP’s. I had to, they were just too cool! 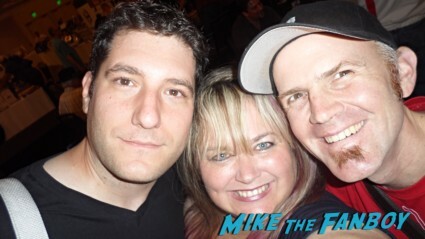 We had a fun afternoon and ran into a bunch of MTF readers and awesome folks so it was great to chat with everyone! Teen Witch Cast Reunion and Q and A! Meeting Robyn Lively and Mandy Ingber! Autographs and More! TTM Tuesday! Ace Gives The Scoop On Broadway! Who’s On! Who’s Signing! Who’s Not! And Where To Write! Alec Baldwin! Nathan Lane! Emilia Clarke! Autographs! And More! That’s awesome! So jealous. Patricia is coming to a convention in Chicago in August and I have been looking for that exact RHPS item to be signed by her! Mike, is it a normal poster, or…? Do you remember where you bought it? Thanks for the help! Susan: I got to say hello! 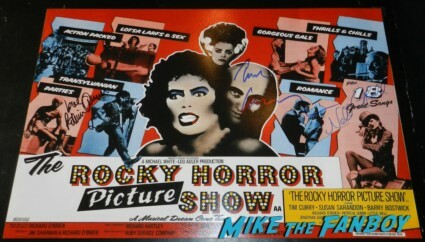 Yeah, the “Rocky Horror” cast was amazing and I absolutely adore them to death. They definitely made the trip well worth it to LAX. My only complaint was too many cancellations and everyone it seems was charging $25+, no matter who they were, which seemed super strange for a bunch of them. A LOT of no-shows. Quite a bummer and yes, people seemed to be charging a bit much. Still fun though. love the stillwater lps and the cover, great items to have! I have those very same props from Almost Famous! 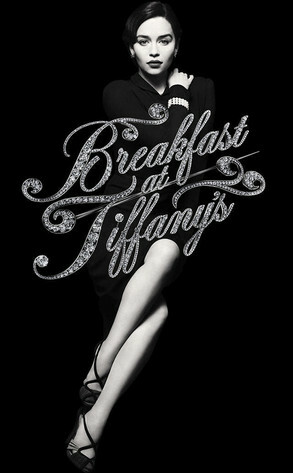 I love that movie SOOO much!! !